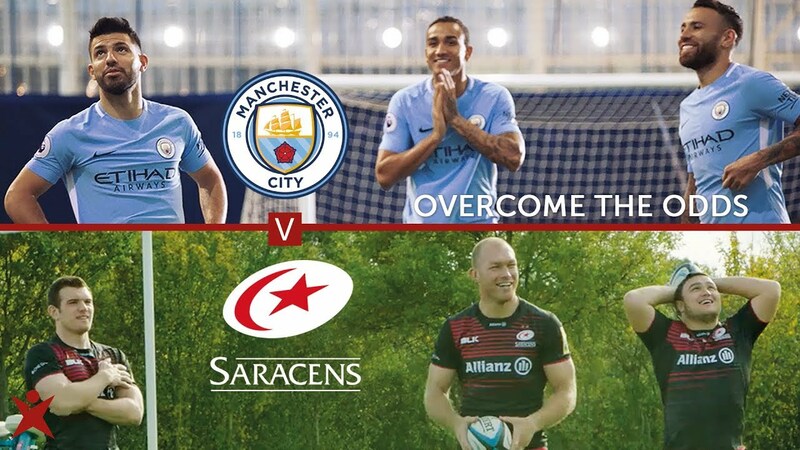 European Rugby champions, Saracens, are facing their biggest test of the season so far…in a series of challenges against Premier League leaders Manchester City, in a test to see if both teams can overcome the odds as stakes continue to rise during the 4th episode of the series. In the fourth episode, ‘Clay Pigeon’, the Saracens team have to hit a series of fast moving targets. The four players are tested on speed and accuracy of their ball throwing skills, with the challenge reaching a climax as they take aim at a fast moving clay pigeon machine. Sergio Aguero, Fernandinho, Nicolas Otamendi and Danilo lead the line for City, whilst Jamie George, Schalk Burger, Ben Spencer and Richard Barrington represent the Sarries. Ex-Manchester City goalkeeper Shay Given and former Saracens player Jim Hamilton act as captains for their respective teams. For more information on the Overcome The Odds series and to watch the latest episodes click here.